Born in the village of Trikkur, Kerala State, on December 15, 1908, Swami Ranganathananda joined the Ramakrishna Order, the international spiritual and cultural movement founded by Swami Vivekananda, at its branch in Mysore in 1926. He was formally initiated into Sannyasa in 1933 by Swami Shivananda, one of the eminent disciples of Sri Ramakrishna and the second President of the Order. After spending the first twelve years in the Order's branches in Mysore and Bangalore, the first six years of which as cook, dishwasher and house keeper and later as warden of student's hostel, he worked as Secretary and librarian at the Ramakrishna Mission branch in Rangoon-from 1939 to 1942, and thereafter as President of the Ramakrishna Math and Mission, Karachi, from 1942 to 1948. From 1949 to 1962, he served as the secretary of the New Delhi branch of the Mission, and from 1962 to 1967, he was the Secretary of the Ramakrishna Mission Institute of Culture, Calcutta, Director of its School of Humanistic and Cultural Studies, and Editor of its monthly journal. From 1973 to 1993 he was President of Ramakrishna Math, Hyderabad. From 1994 to 1998 he was Vice-President of world-wide Ramakrishna Math and Ramakrishna Mission and become its president in 1998. He stayed at Belur Math, till his paasing away in 2005. He had undertaken extensive lecture tours from 1946 to 1972 covering 50 countries as a spiritual and cultural ambassador of India. From 1973 to 1986 he visited annually Australia, U.S.A., Holland and Germany. He had a versatile and facile pen, and had to his credit a number of publications. Swami Vivekananda said, "So long as the millions live in hunger and ignorance, I hold every man a traitor who, having been educated at their expense pays not the least heed to them". This present publication is the transliteration of an enlightening lecture delivered by Swami Ranganathanandaji of Ramakrishna Mission at an Institute engaged in training public administrators of India. Swami Ranganathanandaji, the cultural and spiritual ambassador of India, is the most competent torch bearer of Swami Vivekananda's ideals and is a firm propagator of the social and political relevance of the Gita in today's world. 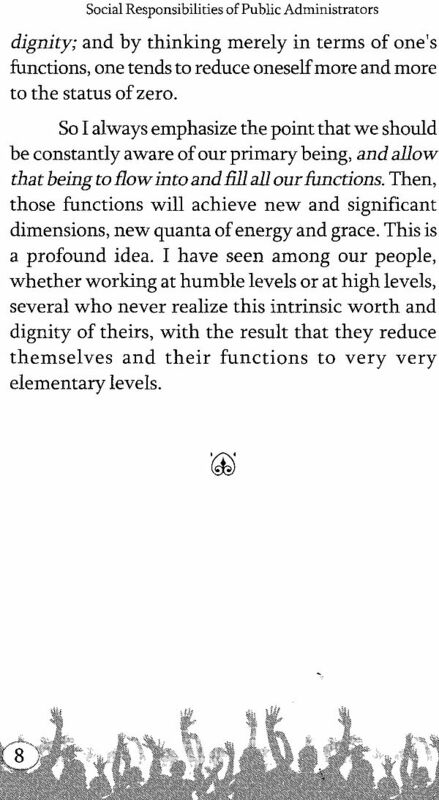 He quotes Swamiji and the Gita freely to drive home his convictions forcefully. 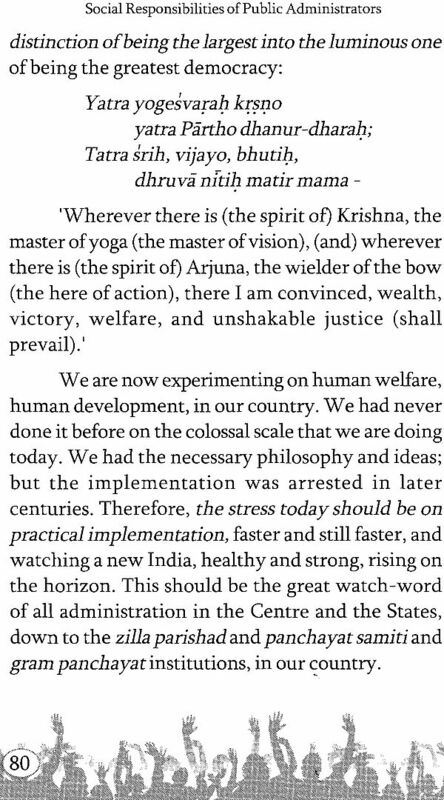 In this speech Ranganathanandaji addresses the maladies of present day public administration up- front and recommends sensible and realistic solutions for them. Our country's record in the field of spirit of service in its government and public service institutions is dismal, and a change can come only when the administrator develops a capacity for "imaginative sympathy". The ideal situation will be: Sitting within the walls of the secretariats, far away from actual human problems, the officer can imaginatively experience the sufferings of thousands; imaginative sympathy is spontaneously stirred as soon as he or she opens a file in front; for that file speaks volumes about problems of people who are behind the file. With that triggering action of imaginative sympathy the administrator responds to the human situation quickly and efficiently, and the nation marches forward. 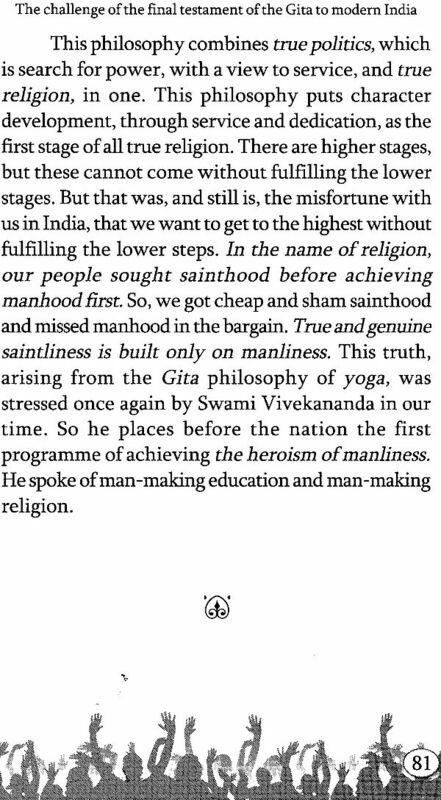 The Swami quotes the Gita's emphasis on work efficiency and character-efficiency. 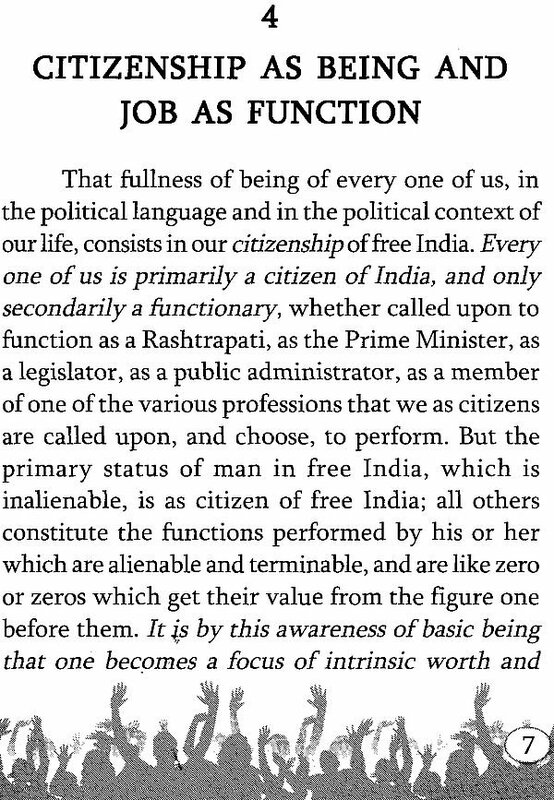 Here was given a clarion call for profound inner transformation, a spiritual growth through love and service of man which make man conscious that they are basically citizens of free India, who are called upon to perform a tremendous national function and mission. Imbibing this humane aspect will make all the difference. 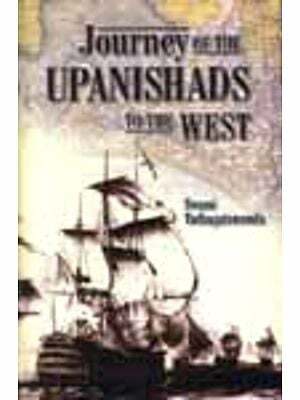 This address was first was brought out in book form by Bharatiya Vidya Bhavan in 1979. We are thankful to Bharatiya Vidya Bhavan for according us permission to print this book in a new form. We hope the public servants will derive benefit from it and will wake up to the need of invigorating the system of the public administration. This will help the responsible citizens rouse our mother-land once more, make her rejuvenated and more glorious and thus fulfil Swamiji's dream of Awakened India come true. Swami Ranganathananda of Sri Ramakrishna Mission does not need any introduction to those in India or abroad. He has been a cultural and spiritual ambassador of India and has been so much with us and yet not of us - a true mukta. Swamiji's forte has been that he takes up the problems of the men around him and stimulates them to tackle those problems vigorously with the inspiration of the age old teachings of vedanta. It was in this spirit that he spoke to a capacity crowd at the IIPA auditorium in August last year with the Vice-President of India, Shri B.D. Jatti, in the chair. His subject was 'Social Responsibilities of Public Administrators.' I will not be exaggerating when I say that not a single person among the privileged audience was left unmoved by Swamiji's inspired words surcharged with the quintessence of Upanishadic wisdom. Swamiji is seen repeatedly to emphasis these sentiments of the great maharshi. I am grateful to Swami Ranganathananda for his lecture and I am also grateful to Shri B.D. Jatti for presiding over the function. It was very kind of Director Sri Haldipur to ask me to come here and spend some time with you in this Institute, which is engaged in training our public administrators. I accepted his invitation, because I have a very great conviction that the happiness and welfare of the people in a state depend upon the type of administration they get and, naturally, on the quality of the administrators. Ever since we became free, we have been seized of this problem of the training of our administrators, and various institutions have been set up of this purpose. I have been often addressing our National Academy of Administration, first in Delhi, later on in Mussoorie. It is always a delight to me to spend some time with the intelligent young men and women of our country undergoing pre-service or in-service training for national administration. In this Institute, we have senior officers under training who, along with its staff members and several interested members of the public, Sri Haldipur informs me, provide an excellent context for me to speak on the announced theme: Social Responsibilities of Public Administrators.